A postcard depicting the exterior of the Hygeia Baths, a three-level structure that featured saltwater baths during the golden era of Atlantic City, New Jersey. The baths were destroyed during a hurricane in 1944, and saltwater swimming pools eventually lost popularity. Originally published by P. Sander. DeAngelis, Martin. "Sand In My Shoes: Saltwater pools harken back to Atlantic City's golden age." Press of Atlantic City, October 8, 2011. http://www.pressofatlanticcity.com/life/sand-in-my-shoes-saltwater-pools-harken-back-to-atlantic/article_b0f26793-865d-592f-bfd5-bc586ec2b6f4.html. 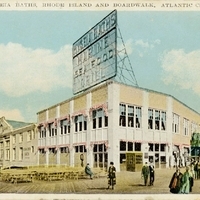 “Hygeia Baths, Rhode Island and Boardwalk Postcard.” RICHES of Central Florida accessed April 19, 2019, https://richesmi.cah.ucf.edu/omeka/items/show/6740.